The Three Colors Trilogy includes RED, BLUE and the basic edition of GreenGreenerGreenest by Néstor Romeral Andrés at a reduced price. 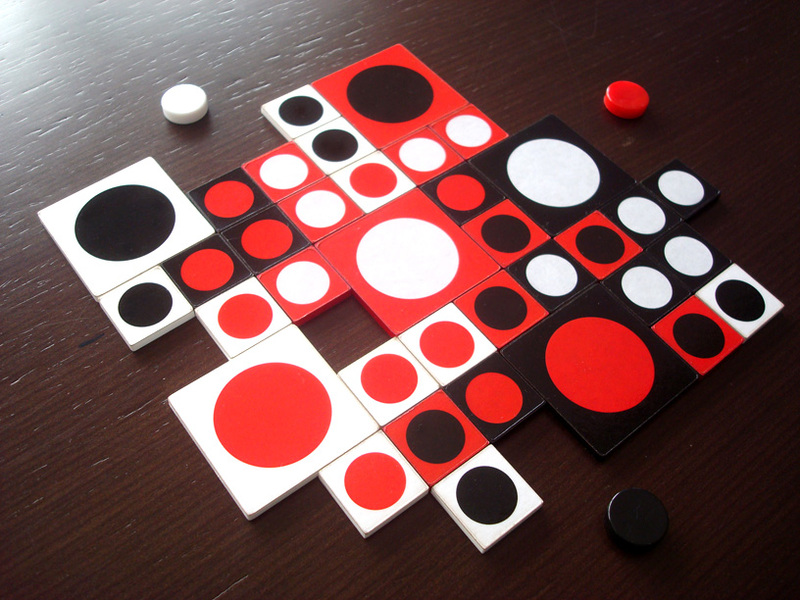 RED is a three-colored tile-laying game for three players with a variant for 2. The three colors in the game are black, white, and red, and each player will be a different color. Each tile has a background color and a different-colored circle in the middle. Players place tiles on the table trying to connect groups of their border color and groups of their circle color. Components: 36 laser-cut acrylic tiles, 3 counters (white, black, red), carrying case. 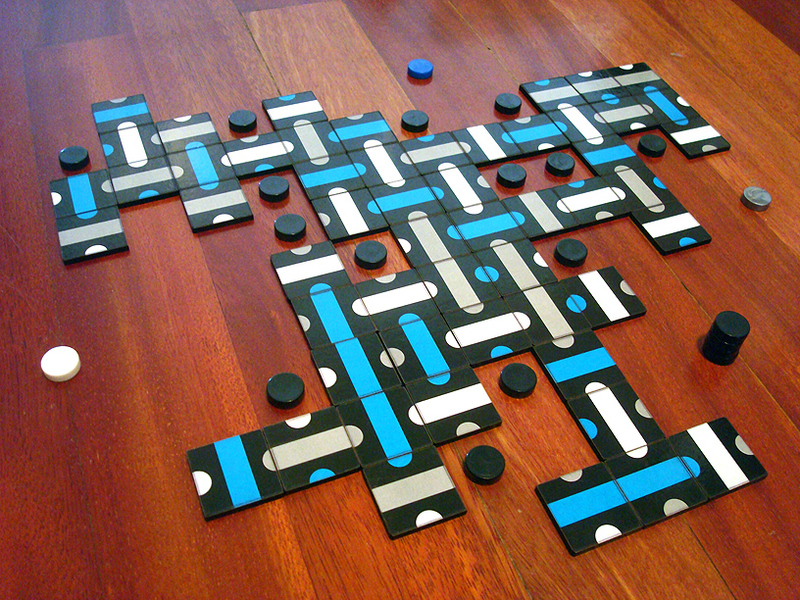 BLUE is a three-colored tile-laying game for 3 players with a variant for 2. It is a crossbreed of the games RED and HONG, by the same designer. The three colors in the game are white, gray, and blue, and each player will be a different color. Each tile has a segment and 2 semicircles, each of a different color. There are 3 combinations in total. A row is a straight line of one or more aligned segments of the same color with a semicircle of that color on each end. A spot is a circle made of 2 semicircles of the same color with no segments in between. 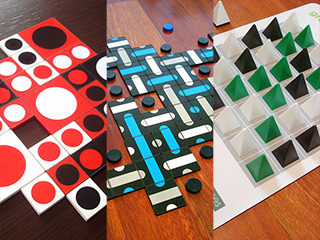 Players place tiles on the table trying to create as many rows and spots of their color as possible. Components: cotton case, 54 laser-cut acrylic tiles (3cm side), 18 black discs, one white disc, one gray disc, one blue disc. GreenGreenerGreenest is a compilation of three games - Green , Greener and Greenest - that use the same set of components. Green is a game for 3 players derived from The House Of The Flying Blades , by the same designer, that uses a non-transitive capturing mechanism. 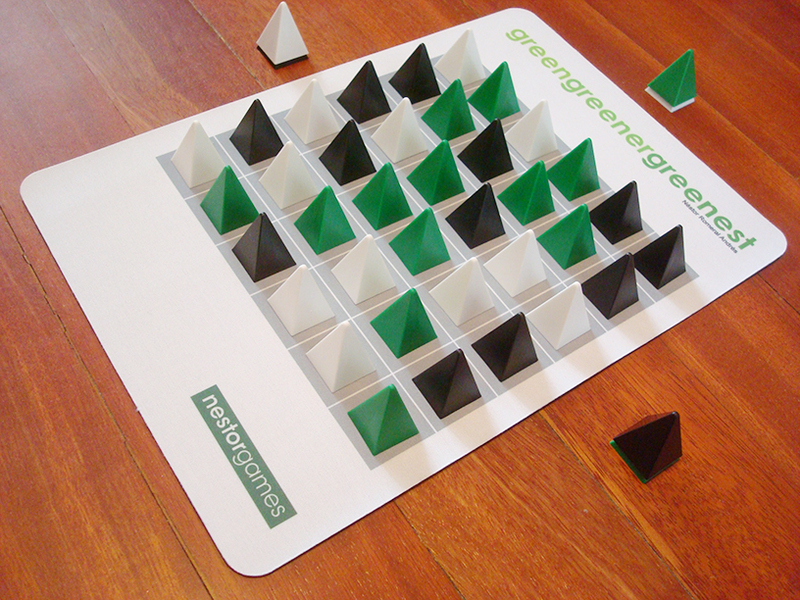 Greener is a capturing game for 2 players, where both must capture the same color. Greenest is a solo puzzle with the same mechanism as Green. Components: 6 x 6 board (one pad), 15 black pyramids, 20 green pyramids, 15 white pyramids, carrying case.